When facial hair turns grey and doesn't match the hair on your head, the look can be unattractive. 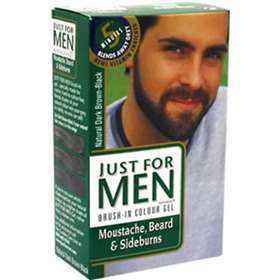 But, before you shave off your moustache or beard, try Just For Men Brush-In Colour Gel. It's easy. Using the brush included in the package, apply - wait 5 minutes - then rinse. The thick, no-drip gel is specially made to penetrate coarse, grey facial hair. Vitamin-enriched conditioners leave your facial hair softer, easier to control. The look is completely natural, matched up to the rest of your hair. We know how unique a man feels his moustache or beard is. Make sure you use the only product uniquely designed for facial hair. Enriched with natural conditioners: Aloe Vera Extract, Chamomile Extract and Wheat Protein.